Outline permission is normally granted to applicants who want to have permission in principle for the erection of a building, before going through the expense of preparing detailed plans for full permission. In certain cases, a local planning authority would require some details of the development (i.e. proposed access) along with the outline application to determine whether it is in line with the approved plan of the area. An outline application cannot be used for change of use or for development affecting a conservation area or listed building. 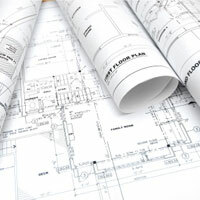 When an outline planning permission is granted, a further application has to be made for anything not included in the permission, these details are known as reserved matters. They have to do with the access, appearance, landscaping, scale and layout of the proposed development. Access to and within the site for vehicles, cycles and pedestrians. Details need to be provided on how the proposed access fits into the surrounding access network. The visual impression of the building or place. It includes aspects of a building or place such as its architecture, materials, decoration, lighting, colour and texture. Physical enhancement or protection of the land (excludes building). It includes screening of fences, tree planting, hedges, shrubs, grass, garden layout, courts, squares, water features, sculpture, public art, walls or other means, formation of banks and the provision of any other amenity features. Scale means the height, width and length of each building in the proposed development in relation to its surroundings. Layout means the way in which buildings, routes and open spaces within the development are set out in relation to each other and to other buildings around the development. An application for reserved matters must be made within three (3) years from the grant of the outline permission, if not the permission will lapse.